Click To Pray is the official prayer platform for the Pope’s Worldwide Prayer Network and EYM (Eucharistic Youth Movement). 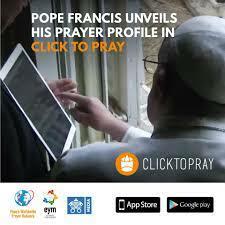 Its mission is to disseminate the Pope’s monthly intentions and promote a rhythm of daily prayer. And it has recently been relaunched with an updated look, making the platform more user friendly and inviting and now includes English as a language option. In a world where digital technology is fast becoming the means of communication, the Vatican has been hot on the heels bring its communications into the 21st century. Now the Pope’s Global Prayer Network has a wider reaching audience, especially with our young people who communicate ‘on the go’. What is Click to Pray? Part of the Pope’s Worldwide Prayer Network Click To Pray invites men and women from around the world, and especially young people, to accompany the Pope in a mission of compassion for the world. The aspiration is to unite the disciples of Jesus, and all those who wish to join them, to pray together for the great challenges of this world and of the mission of the Church, expressed in the Pope’s intentions. The Pope’s intentions invites everyone to pray together with the Pope for his intentions, which express the challenges facing humanity and the mission of the Church. The intentions are monthly and each one has a different theme. They propose a very specific prayer and a number of actions for the month. By praying alongside the Pope we make this worldwide network of prayer a reality. The Daily Prayers offer three daily prayers to recite with Jesus. One in the morning, one during the day, and one at night. This structure helps you to pause for a moment, three times a day, to return to the silence of your heart and be open to the Lord. Three prayers for each of the 365 days of the year, through which you can pray for the challenges facing humanity and join different cultures, languages and people for this universal cause. This can be a good springboard to start, re-establish or develop a routine of prayer in your day. Finally, the Prayer Wall lets users can share their own prayers with the world. They can also join in with other people’s prayers and pray for their intentions. What better way to express our unity as a Catholic family and a global family than to lift up one voice to the heavens for a fellow brother or sister in need! Click to Pray is available via the website (https://clicktopray.org) and a mobile app, both for Android and iOS. It is currently available in six languages (Spanish, English, Italian, French, Portuguese, and German). Simply visit the appropriate section to view the intentions and then click the candle to show that you have prayed – Click to Pray!